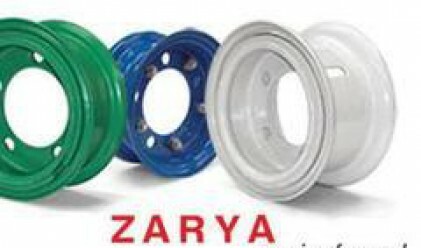 Balkancar Zarya, manufacturer of rims and disc wheels for industrial vehicles, forecasts 8.3 mln leva (4.24 mln euros) revenue from product sales for 2008. The figure would represent a 37-percent year on year increase. The overall sales revenue of the company is forecast to reach, nearly 9 mln leva (4.6 mln euros), compared to 6.7 mln leva (3.42 mln euros) raked in for 2007. The volume of the sales and the increase in the prices of the company's products are expected to mark a 29% and an 8% year on year increase in 2008, respectively. The planned increase in the sales volume may be put down to the attracting of new clients in the original equipment manufacturer (OEM) segment. Balkancar Zarya booked 6.7 mln leva net sales revenue for 2007, up from 4.6 mln leva (2.35 mln euros) raked in for the previous year. The profit of the company amounted to 71,000 leva (36,300 euros) for 2008, compared to 556,000 leva (284,000 euros) and 764,000 leva (390,600 euros) posted for 2006 and 2005, respectively. The bulk of Balkancar Zarya's output is exported. Exports accounted for 93% of the sales of the company in 2007, up by 1% from 2006. The direct exports made for 67% of the overall sales of the company in 2007, while their share stood at 55% in 2006. The biggest markets for the company include Germany, accounting for 31.8% of the revenue, Great Britain (28.7%), South Korea (13.1%), Italy (10.1%) and France (9.1%). The share of the domestic market in Balkancar Zarya's sales declined from 8.4% in 2006 to 6.6% a year later. The company utilized 88% of its production capacity in 2007, compared to 61% in 2006. Balkancar Zarya invested 1.4 mln leva (715,800 euros) in the acquisition of long-term tangible assets in 2007, compared to 143,000 leva (73,100 leva) investments made in 2006. Major shareholders in the company include KVK Invest (44.756%), Furazhi Pravets (solely owned by KVK Invest) with 41.117% and Skand. Enskilda Banken with 4.998%.